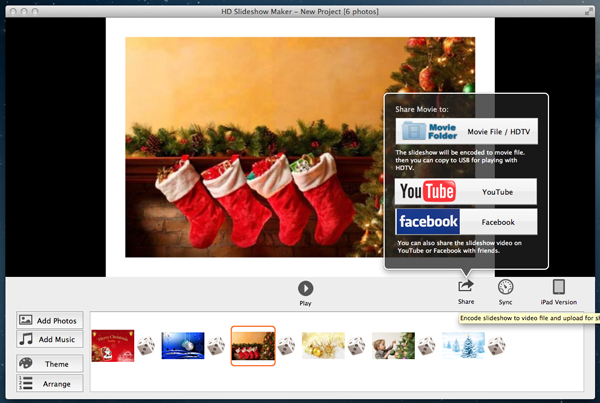 Wanna present and share your photos as an eye-catching slideshow with music and transitions on Mac? 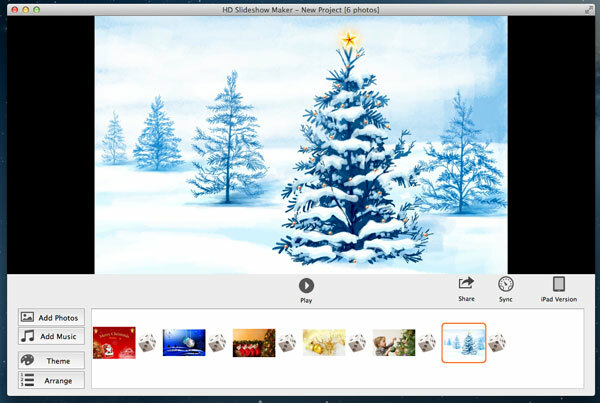 In this article, I will introduce a decent slideshow maker for Mac – HD Slideshow Maker. Also I will show you how to make a HD video slideshow from pictures with music, transitions, pan / zoom effects, text and more effects on your Mac computer. With HD Slideshow Maker, you can easily and quickly convert digital photos to an amazing musical slideshow. Then you can watch the slideshow on your Mac computer or TV for viewing photos in an interesting way. Also you can upload a photo slideshow to Facebook and YouTube for sharing with friends. Click “Add Photos” to import photos to the software for your Mac computer. You can see the thumbnails of photos imported at the bottom of the screen. 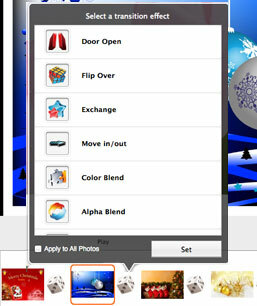 To arrange the photos order, click “Arrange” icon, then drag photos to the place where you want to put. A silent slideshow is just like a silent movie. You can add more than one songs as background music. To “Sync” icon enables you to sync slideshow time with music time, so they can play in pace with each other. HD Slideshow Maker enables you to organize songs added.Click the green music bar at the bottom , then you can see “The list of background music” window. Use correct buttons to play music, add or delete songs and arrange song order. Click “Theme” to choose a theme for your slideshow. The software provides kinds of themes for choosing. Also you can customize a theme with a beautiful image. The theme will make your slideshow eye-catching. Once photos are imported, they will be applied random transitions. However, you can change them by clicking the transition icon between photos (like dice). Among all the transitions, what most fascinating transitions are the 3 D transitions. Make sure HD slideshow Maker is the current running app, click HD slideshow Maker from the top of your screen(next to Apple icon) and select “Preference”, in the Options window, you can set time for photos and transitions. Tick the “Repeat slideshow at the end” to loop the slideshow. 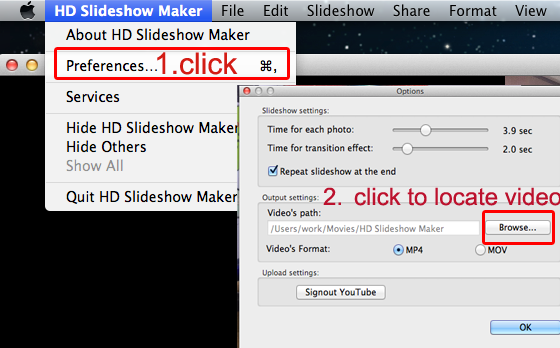 In the Output settings area, you can locate the slideshow’s path and choose video’s format from MP4 or MOV. Before exporting the slideshow, you can preview the effect by clicking “Play” button. If you are not satisfied with it, go back to make changes. Or else, go to next step. Click “Share” icon, you can save and share the slideshow. You can save it as a video to your Mac computer, or upload it to YouTube and Facebook directly for sharing. To play the slideshow on your HDTV , you can copy the video outputted to a USB drive, then plug the USB drive into your HDTV USB port to play the slideshow. This entry was posted in Mac Slideshow Maker and tagged best slideshow app for mac, create music slideshow on mac, mac slideshow software, slideshow maker for OS X on December 11, 2012 by Sarah Jablich.